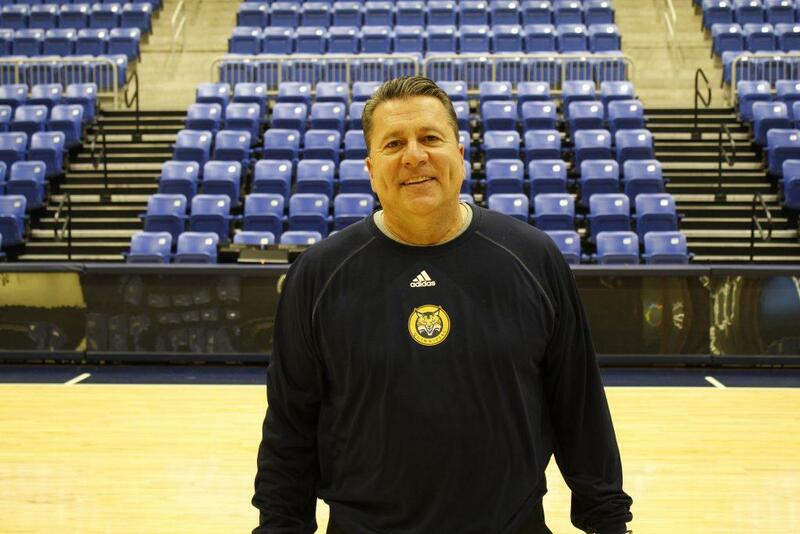 Quinnipiac men’s basketball’s associate head coach Tom Pecora has been around the game of basketball in the New York-metro area for his whole life. After stops at Hofstra and Fordham, among other places, and working with college basketball legends like Rollie Massimino and Jay Wright, as well as many others, Pecora is in his second year with Baker Dunleavy in Hamden. I sat down with Pecora to talk about his career. You were a long-time assistant at Hofstra, before you were a head coach, Jay Wright was there. What was your experience like working at Hofstra? We were kids. We had both been assistants for Coach Massimino at UNLV. We came from there. For me it was a homecoming. It was a trial and error. At the time we were in our early 30s. We were just experimenting with different things. Now we came from UNLV, we had 23,000 people at every home game. One of the funny stories is the first game the first year, before the game started we were in the old building at Hofstra, the old gym and he said ‘what do you got?’ I said ‘73.’ He said ‘what’s that?’ I said ‘that’s how many people are in this gym.’ 73 people came to our first home game. After year one, we got a good player named Timmy Beckett. Then we get Speedy Claxton, who really kind of made our program. It was just a great experience. A real opportunity to grow. We’ve been friends since college, so that aspect of it was cool. It was great to build a program. I had been a head coach at a junior college for three years prior to that. That came in handy. I made some mistakes doing that. It was a great opportunity to grow as a coach, and do it at home. It was nice to get back home. So then you move on to Fordham. Obviously it didn’t go as you had planned. What’d you learn from your time there? Well I learned a lot. I became a better coach. Going into games in the Atlantic 10 at the time, we were trying to rebuild a program that had won two games the year prior to us getting there. The year prior they had won three games. We were really building from the ground up. At the time, the Atlantic 10 was a five and six bid conference, so it was at its peak as far as the level of talent. We were playing against great teams. It took longer than we thought. I thought we were at the precedes. We were about to break through. We had Eric Paschall, who is now at Villanova, and obviously a pro. He had a great season last year for them. Joseph Chartouny is playing at Marquette right now. He’s another guy we brought in. He was another rookie of the year. Three other kids transferred to UConn, Boise State and Creighton. We had a young bunch of good players. We just weren’t able to finish the job. When you go out with lesser talent, which was the case the first couple years, it really tests your grit as a coach. We were in a lot of games. We always had a winning non-conference record, but once we got to the A-10, we would get overwhelmed by talent. We could hang around with teams down the stretch in a lot of games, but they just were able to get over the top. Then after you spent two years in TV, you come to Quinnipiac. What drew you in here? A lot of things. First, I’ve known Baker for a long time. I had opportunities to go to some bigger schools. During my time off and then when I decided I was going to come back I had talked to a few people about it, but I didn’t want to be too far from home. We have two girls and a boy. Our youngest guy is a junior in high school now. I wanted to be within striking distance. I didn’t want to have to get on a plane to come back home every other weekend to try and see him and my family. That was important. The other thing was knowing Baker as long as I’ve known him and knowing the kind of guy he is, the kind of man he is. I would be comfortable here and he would respect my opinion on things, and I would be used the right way. The other thing was the facilities. I know Greg Amodio a long time. You have good leadership here. I’ve heard the legend of John Lahey from other people. Having met and spent time with him, obviously, it was impressive. Then when I saw what they had done to this campus and this kind of facility, and the opportunity once again to build a program. I had done that at Nassau Community College. I was an assistant coach. For the first time we went to the NJCAA Tournament. I rebuilt a program at Farmingdale. We were a top 20 team nationally in junior college. At Hofstra, Jay and I rebuilt something together. At Fordham, even though the results didn’t turn out the way we had planned in year five, I felt confident going forward in years six, seven, the following years. The program was on steady ground to be rebuilt. There’s a blueprint for this, and I felt comfortable doing it. And I knew that it just was a place that was going to give the support to get it done. What about your relationship with Baker. What’s that dynamic like? It’s great. I remember Bake’s dad. He’s five years older than me. I was a kid, an eighth grader, and I remember watching his dad play at Nazareth High School in a Christmas tournament in Brooklyn. His father was the best player in New York City that year. One of. Him and a guy Butch Lee who played at Marquette. It’s an interesting relationship, in a very positive way. I think that he wouldn’t have brought me out here if he thought I was going to overstep my boundaries. I am very aware of what my role is here, and how to be the best older assistant coach I can be without getting out of my lane. Stay in your lane. Understand what your job is. The great line is: ‘assistants give suggestions, head coaches make decisions.’ I’m quick to make suggestions to him, and he relies on me for a lot of things. That makes it good work. I feel positive about it, and I feel great about making a young coach get better every day. You recruited Savion here. What is that process like when you’re trying to get a high school player to come here? How do you go about that? It’s all about relationships. Savion and Tyreese Williams. His (Williams’) high school coach was my grad assistant at Hofstra. People at Cardinal Hayes, I’m very close with a number of board members there. So there’s long-standing relationship in the New York Catholic League. With Savion, I taught his high school coach when I was a middle school physical education teacher. His guidance counselor was a grad assistant at Hofstra when I was coaching at Hofstra. There were a ton of connections there. That’s what this business is about, like any business. So much of it is about relationships and then about your body of work. When you can go into a gym and into a family’s home and you have a body of work where you can be trusted. When you have graduated 100% of your players. When they know the pedigree of Baker, and coming from Villanova. Obviously that’s something that’s very impressive to people. And they can just trust you. It really becomes a matter of trust. And because they’re going to entrust their son in you for four years, and when you talk to them about the fact that everyone I’ve ever coached graduates. That’s the only way I know how to do it. That puts their mind at ease. And then you talk to them about the way you play basketball. And the way you’re going to treat their son, not only as an athlete, but off the court. It really just comes down to a matter of trust. Then you express to them, you give them some names and say ‘call this other player’s parents. Call this person that you know, mutually. Reach out to those people.’ The people say you can trust these guys. Who has influenced you most in your career and why? Rollie Massimino. He gave me my first break. I had an opportunity to work for Bob McKillop, who is now the head coach at Davidson, as a high school coach. Rollie Massimino and Jay Wright. Two guys that have won national championships and Bob McKillop’s been to the final eight. I’ve been blessed to work with really smart, motivated coaches. Coach Massimino took me in like a second son and gave me an opportunity that no one else would give me when he made me his assistant at UNLV. I was teaching kindergarten and coaching junior college. I owe him a lot. What teams are you a fan of? When I was ten, the Mets won the World Series. The Knicks won the World Championship. The Jets won the Super Bowl. I thought it was going to happen every year, and it hasn’t happened since. What NBA player would you like to have dinner with? I’ve had some with a couple present NBA players. I guess I would have to say LeBron. Just because he’s the man. My favorite players when I was a kid were Pete Maravich and Tiny Archibald. I’ve hung out with Tiny. I didn’t have the pleasure of meeting Maravich before he passed away. Better pizza – Long Island or New Haven? Brooklyn. There’s a bunch of spots that are pretty good in Brooklyn. Favorite New York sports radio host? Sports radio? Gotta be Mike. He’s the king of New York Sports radio. Although Michael Kay is very good too. He’s a Fordham grad. I became very good friends with him. I know they got a little turf war going on, but I think that’s good. I think that’s healthy. It keeps you motivated. It’s like a good sports rivalry.